Doctor Who is to return to BBC One on 30 March in a modern day urban thriller 'The Bells of St John', as the first official image is revealed giving fans a sneak peak at what to expect from the epic new series that starts on Easter Saturday. 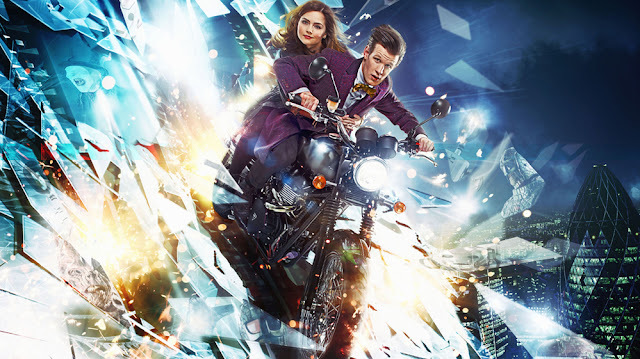 Written by Steven Moffat, 'The Bells of St John' will mark the official introduction of the Doctor's newest companion, Clara Oswald, played by Jenna-Louise Coleman. Having already made two appearances last year, the opening episode will be the first time fans get to see the Clara that will accompany the Doctor across the series' eight adventures. Set in London against the backdrop of new and old iconic landmarks, The Shard and Westminster Bridge, 'The Bells of St John' will also establish a new nemesis, the Spoonheads, who will battle the Doctor as he discovers something sinister is lurking in the Wi-Fi. Featuring a movie a week from a ghost story to an underwater siege to a period drama, the series will also introduce new monsters, as well as bringing back fan favourites the Ice Warriors and Cybermen. Meanwhile the BBC Cymru Wales-produced series' stellar list of guest stars includes: Celia Imrie; Richard E Grant; Warwick Davies, Jessica Raine; Dougray Scott and Tamzin Outhwaite, as well as for the first time on screen together, mother and daughter Dame Diana Rigg and Rachael Stirling.Visit the BBC Doctor Who 50th Anniversary Shop!